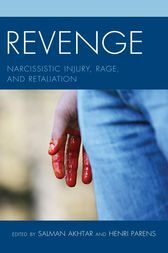 Revenge: Narcissistic Injury, Rage, and Retaliation addresses the ubiquitous human wish to take revenge and settle scores. Featuring the contributions of eleven distinguished mental health professionals, it offers a panoramic and yet deep perspective on the real or imagined narcissistic injury that often underlies fantasies of revenge and the behavioral trait of vindictiveness. It describes various types of revenge and introduces the concept of a ‘good-enough revenge.’ Deftly blending psychoanalysis, ethology, religious studies, literary criticism, and clinical experience, the book goes a long way to enhance empathy with patients struggling with hurt, pain, and desires to get even with their tormentors. This volume is of great clinical value indeed! The cycle of humiliation, revenge, and counter-revenge is a central paradigm which plagues our species. Finally there is a fascinating study of this all too human phenomenon which draws on the insights of child development, psychoanalytic experience, great literature, and biological considerations. Written by premier clinicians and theoreticians, this book is both very rich in ideas and is very readable. Therapists at all levels of experience will learn much from this text and become more able to address these issues in treatment. Salman Akhtar, MD, is a professor of psychiatry at Jefferson Medical College. He is also a training and supervising analyst at the Psychoanalytic Center of Philadelphia. Henri Parens, MD, is a professor of psychiatry at Jefferson Medical College. He is also a training and supervising analyst at the Psychoanalytic Center of Philadelphia.